Alabama's Largest Abandoned Vehicle Lien & Title Service. Lost Titles / Replacement Titles ? 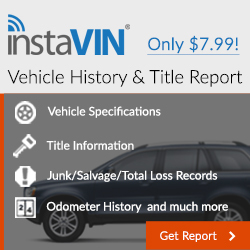 Purchased a Vehicle Without a Title ? Sell Your Abandoned Vehicles Legally! Do you have a vehicle your customer will not pay and pick up? After 48 hours, the vehicle is legally considered an unclaimed vehicle. We prepare and process lien sale documents, giving you the right to sell your abandoned vehicles. Abandoned vehicles can be sold, to recoup some or all the money invested in the vehicle. We contact owners and lien holders, requesting they pay you. If this fails, we prepare the documents, giving you the right to sell the vehicle. Got A Vehicle & Need A Title? We can help you obtain a title to your vehicle. You purchased a vehicle from a friend of a friend, they promise to get you the title, they never get back with you. They either leave town or avoid you all together or you purchased a vehicle, the previous owner signed the title wrong, when you try to get in contact with them, they never return your calls or unwilling to help you correct the title issue. We have a solution! Contact us today! 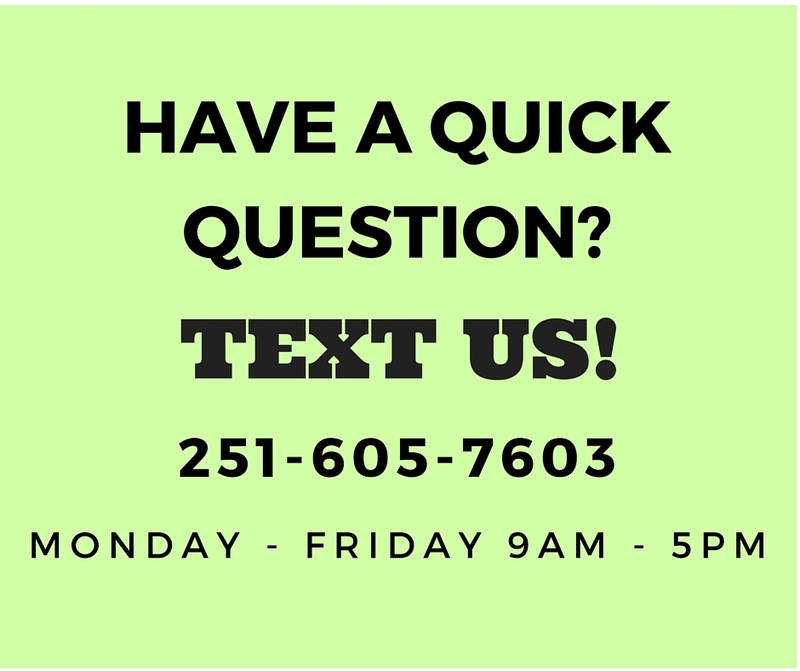 We know you may have questions, we are here to help you! Give us a call to discuss your options with vehicle title problems or your abandoned vehicle issues. – Our services are 100% Guaranteed. If not, you pay nothing! It’s that simple. The New Unclaimed / Abandoned Vehicle Law. The new unclaimed vehicle law went into effect July 01, 2016 and has definitely caused some controversy. I wanted to write this article to give you the ‘Basics’ of what I know and break it all down for you. I’ve been preparing abandoned vehicle sale paperwork for the past 15 years and the new law has made a traumatic change to the way we’ve been doing things. The abandoned vehicle law needed to be updated with more modern techniques and as new circumstances arise with unclaimed / abandoned vehicles, the State needed to come up with a solution. Legal Disclaimer: I am not affiliated with the State of Alabama or any Government Identity. I am a 3rd party processor in business for profit to prepare and process unclaimed / abandoned vehicle documents on behalf of my clients & customers throughout the State of Alabama. This article is just for informational purposes and is not intended to give legal advise. Please consult an Attorney for legal assistance. Legislative Act 2015-470 amended the unclaimed/abandoned motor vehicle law. 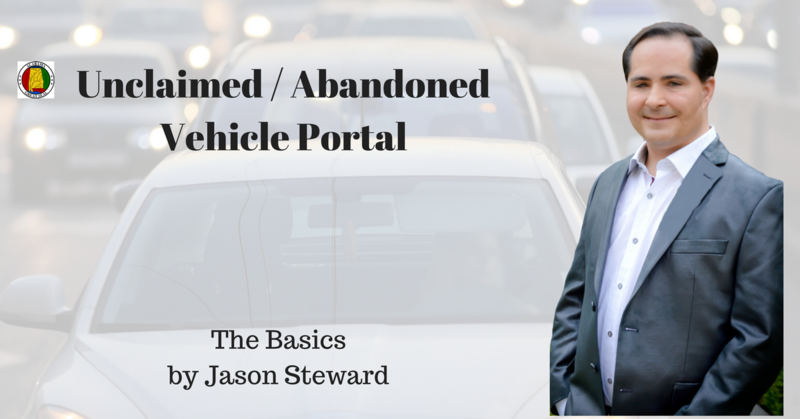 The Unclaimed/Abandoned portal must be used to complete the following process to report a vehicle as “unclaimed” and sell the vehicle as an “abandoned” vehicle. To sell an abandoned vehicle, the unclaimed vehicle MUST be entered into the Alabama Unclaimed/Abandoned portal. Now, the vehicle left unattended or not claimed by the owner for more than 48 hours, the vehicle is considered unclaimed. After the vehicle has been reported to the State and ALL the procedures have been done outlined in the new unclaimed / abandoned law, the vehicle is then considered abandoned and can be sold. 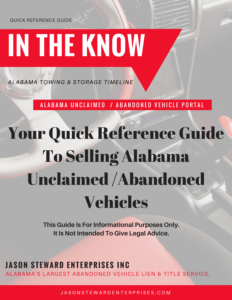 Your Quick Reference Guide To Selling Abandoned Vehicles In Alabama. A motor vehicle left unattended on a public road or highway for more than 48 hours. A motor vehicle, not left on private property for repairs that has remained on private or other public property for a period of more than 48 hours without the consent of the owner or lessee of the property. A motor vehicle, left on private property for repairs, that has not been reclaimed within 48 hours from the latter of either the date the repairs were completed or the agreed upon redemption date. A motor vehicle left unattended on a public street, road, or highway or other property for a period of at least 48 hours. A motor vehicle left unattended because the driver has been arrested or is impaired by an accident or for any other reason which causes the need for the vehicle to be immediately removed as determined necessary by law enforcement. 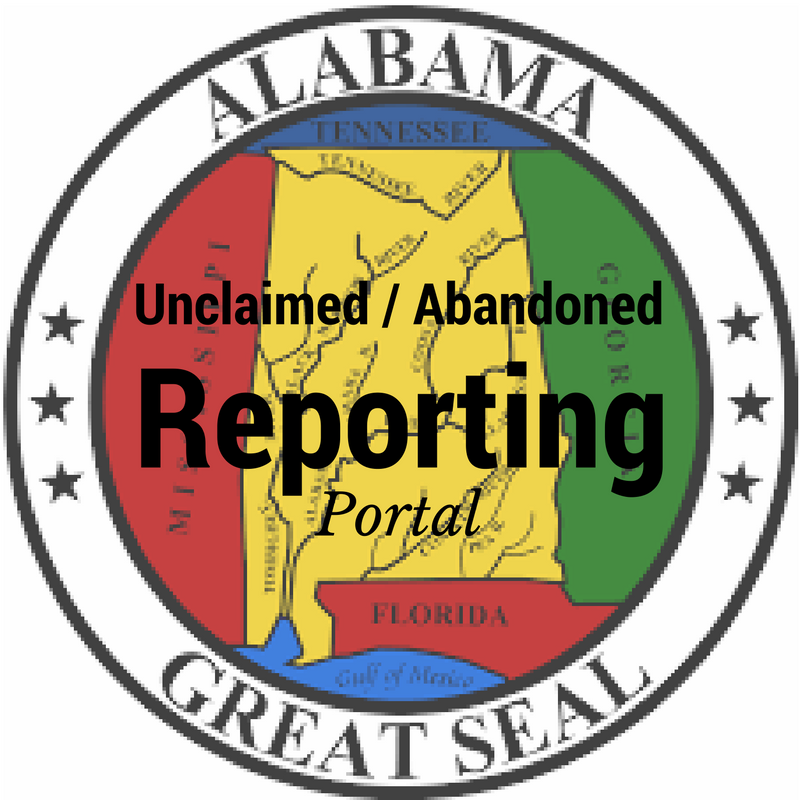 What to do after the vehicle has been reported Unclaimed to the Department of Revenue using the Unclaimed/Abandoned portal? After the vehicle has been reported unclaimed, the Law requires you to start your search for the owner / lien holder information. This may include using the National Motor Vehicle Title Information System (NMVTIS) to determine the State in which the vehicle is titled and/or registered. Some States and Vehicle Title Data Industries provide a service to pull records online while others require a written request by mail. Within 5 days, you are to request an owner/lien holder records request from the State of Record found using the NMVTIS system. Once you receive the records request from the State of Record, within 5 days, you must send a Notice of Possession to the owner and lien holder of record. The owner and lien holder of record must be reported to DOR through the Unclaimed/Abandoned portal along with repairs, towing, daily storage rate and any other fees that is owed on the vehicle. My staff and I at Jason Steward Enterprises, Inc are dedicated to providing you with an exceptional service experience of reporting and following procedures outlined by the State of Alabama on your unclaimed / abandoned vehicles. 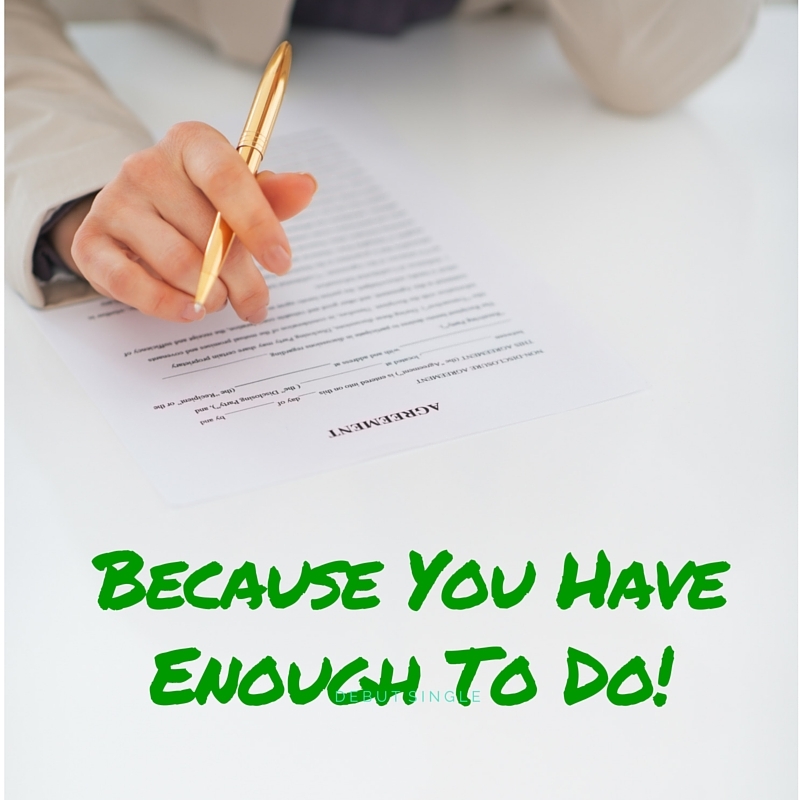 We know you have a business to run and you have enough to do! Contact us today for a FREE consultation on how we can help you and your business stay in compliance on reporting your unclaimed vehicles and preparation of abandoned vehicle sale documents. We are available by phone, email, online chat and facebook chat to answer any questions you have about the new unclaimed / abandoned vehicle law. So the issue were running into being a salvage pool for insurance companies is that when we go to apply for a salvage title for the insurance company, the wrecker services have already started the adandment process and it creates a crap ton of headache for us when applying for the salvage title. Our services are 100% Guaranteed. If not, you pay nothing! It's that simple. 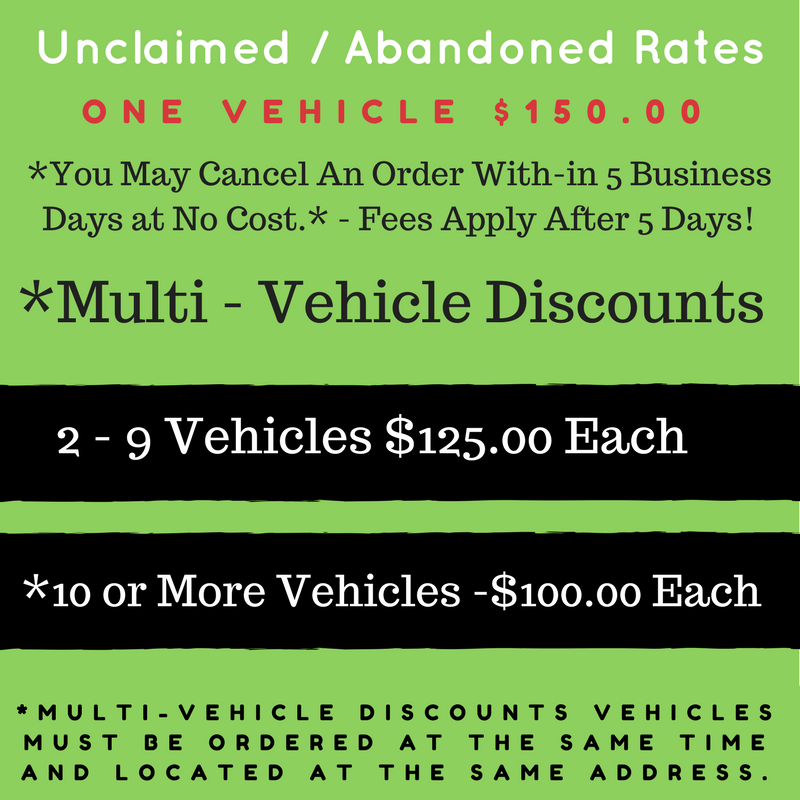 Unclaimed / Abandoned Vehicles Got You Down? How Jason Steward Enterprises Can Help! Jason Steward Enterprises, Inc (2001 - 2019) | All Rights Reserved.